I found this organic cotton twin-sized blanket at my local Target. It's orange and beige with a geometric pattern, and my feet don't stick out. Perfect. Sooo... it's for the living room... and you photo'd it in the parlour on the settee? Ha. Okay, I know... the parlour is a much brighter room. It does go nicely with that color, too. I bet you could even snuggle up there and just look out the window at your lovely-colored trees! Ha, you're on to me! Yes, the living room is sooo dark. Parlor was easier. And I do plan to use it there, too. I'll probably just drag it around with me like Linus. I've also been looking for an orange blanket for my home. I came across this one, but was skeptical of the fabric. Fill us in-- is it soft? Does it keep you warm? It definitely keeps me warm. It's not soft, though. It's not scratchy or anything, but it's not a plush or fleecy texture at all, which would have made it AMAZING. But it's good enough for me. Oh, how I wish we had target here in Europe - I have been looking for a blanket exactly like this - to go with my orange rug! This throw is beautiful! 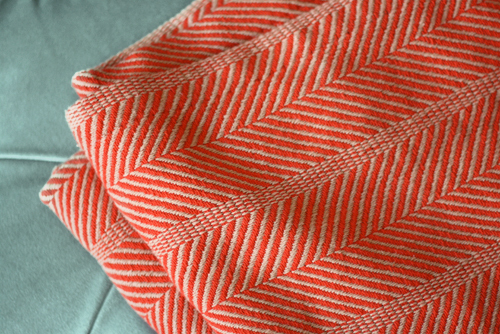 Orange is my fave color and I can't help but buy every orange throw and pillow I see!